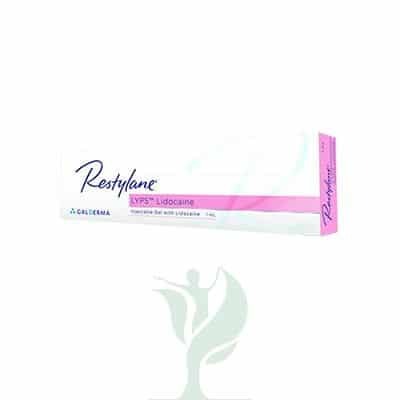 Restylane Lyps is a sterile, transparent, biodegradable gel of stabilized hyaluronic acid of non-animal origin with the addition of 0.3% lidocaine hydrochloride. Restylane Lyps is supplied in a glass syringe with a luer-lock fitting. Restylane Lyps is intended for lip enhancement. It is a filler that adds volume to the tissue, thereby enhancing the lips to the desired level of correction. It should be administered by submucosal injection. The addition of lidocaine provides increased overall treatment comfort. Restylane Lyps is only intended to be administered by authorized personnel in accordance with local legislation. Unlike a general dermal filler, Restylane Lyps was created to stand up to all the wear-and-tear your patient’s lips go through in a day. Restylane Lyps is soft enough to use in the delicate lip area but tough enough to withstand the constant movement from talking, smiling, and eating. You can inject a little Restylane Lyps along the edge of the lips to enhance the vermilion border and give your patient’s lips definition, or you can inject more Restylane Lyps into the center of your patient’s lips to make them plumper. Restylane Lyps even contains lidocaine to reduce patient discomfort during the injections. When you inject Restylane Lyps into your patient’s lips, the hyaluronic acid immediately plumps up in size, which in turn plumps up your patient’s lips. At the same time, the hyaluronic acid promotes the production of collagen within your patient’s lips, gradually building up the structure of the lips and improving skin elasticity. Your patients not only get the size of lips they desire, but you can reshape and enhance their lips, giving them greater definition. Non-animal stabilized hyaluronic acid, NASHA™ (20 mg/ml); Lidocaine hydrochloride (3mg/ml). Restylane Lyps is made from hyaluronic acid, a substance similar to what you would find naturally in the human body. It comes as a clear gel made of non-animal stabilized hyaluronic acid (NASHA) which is injected into the deep submucosal layer of the vermilion. Restylane Lyps comes with two 29 gram thin wall needles.